A genre is a category of art, music, or literature. Following are some popular examples of genres, along with some related sub-genres. Action and adventure are sometimes considered two distinct genres, however, the two go hand-in-hand: they involve stories with exciting sequences and obstacles that must be overcome before reaching a goal. There are many different categories of action-adventure stories. Epics. An epic is a tale, often told in verse, of a heroic figure on a quest. Military stories. Military fiction usually involves stories of battle and espionage from the warfront. Spy fiction. These stories, in the James Bond vein, recount the pulse-pounding expeditions of spies in various agencies throughout the world. Westerns. Stories that take place in the Wild West, typically including gun duels, train robberies, heists, and showdowns, are known collectively as Westerns. Comedies are humorous, funny stories intended to make the reader or viewer laugh. Black comedy. Although these stories are intended to be funny, they also touch darker areas of storytelling, such as death and fear. Parodies. A parody intends to mimic another genre to humorous effect. Parodies can be intended to mock and criticize as well as to pay homage. Rom-com. Romantic comedies, or rom-coms, mix love stories together with comedic events. Slapstick comedy. This type of comedy features physical humor such as pratfalls, silly and exaggerated body language, and unlikely scenarios. Stories about magic spells, mythical creatures, and fabled kingdoms are known as fantasies. These stories sometimes include witchcraft and wizardry, dragons and unicorns, and an emphasis on legend. Fables. This type of fantasy story demonstrates a general truth or a parable. Fairy tales. Often age-old stories that include magic and folklore in addition to traditional fantasy characters like elves and goblins. Legends. While legends may include bits of historical fact, they are usually made to seem larger than life, as in the Legend of King Arthur. Scientific fantasy. A fantasy story that may include elements of scientific fact is known as science-fantasy. Horror stories are intended, as the name suggests, to horrify and scare an audience. The genre of horror has been shocking audiences for many centuries and includes many sub-genres. Ghost stories. These are stories where the dead return to life and haunt the living, such as Dickens' A Christmas Carol. Sometimes the ghosts are trying to teach the living a lesson. Monster stories. Monster stories use creatures that frighten or threaten human beings as the antagonists. Slasher fiction. Popular in cinema, slasher stories tell of deranged killers who are out to punish regular people. Survival stories. These stories paint a future where humankind is up against a threat like zombies or vampires and must survive against the odds. 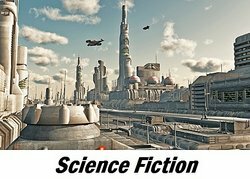 Any story that uses scientific concepts to explain the world or the universe is known as science fiction, sci-fi, or syfy. This genre is very similar in construction to fantasy, except that science is a central theme. Apocalyptic sci-fi. Any science fiction that has to do with the end of the world or the destruction of mankind is known as "apocalyptic" sci-fi. Hard sci-fi. When the science of a particular story is well-researched and stands up to scrutiny, it is considered "hard" sci-fi. Soft sci-fi. Soft sci-fi typically deals less with the complications of applied science and more with the effects of science. Space opera. This type of science fiction deals with the long-term effects of a life lived in space, such as Star Trek or Star Wars. There are many examples of genres and sub-genres. The movies, books, literature and entertainment you enjoy fall into one of these genres. "Examples of Genre." YourDictionary, n.d. Web. 18 April 2019. <https://examples.yourdictionary.com/examples-of-genre.html>.